A reed bed, or constructed wetland is an engineered structure – like a pond – normally rectangular in shape. It harnesses the natural ecological processes that break down organic matter in wastewater. They contain gravels that are usually planted with common river reeds (Phragmites Australis). Contaminated liquid effluent is applied either at one end or across the entire surface (depending on the reed bed type), and collected from the other end by a series of drainage pipes or a weir outlet structure at the bottom. As the effluent passes through the gravels in the reed bed, it comes into contact with the bacteria growing in the oxygen rich atmosphere of the root system and on the surfaces of the gravels. This is the primary agent that breaks down and digests the sewage in the effluent. This is an environmentally friendly, low cost and entirely natural process. Reed beds are highly effective when properly designed and can be used in conjunction with ponds and wetlands to produce near river quality water. 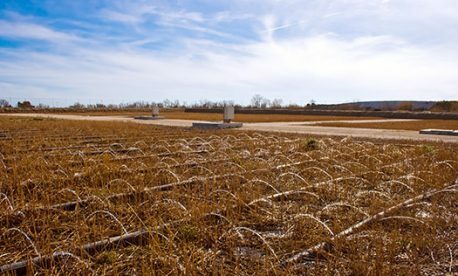 Vertical flow reed beds are more effective at nitrifying effluents: converting ammonia to nitrates and nitrites than most package sewage treatment plants. 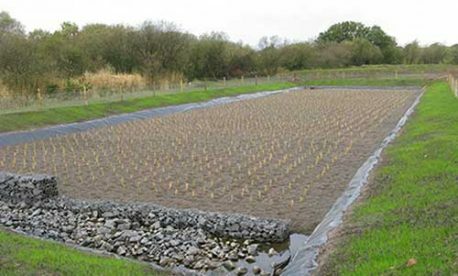 We’ve been at the forefront in providing high quality, durable and tough linings for reed bed systems and constructed wetlands for over 30 years. It is imperative that the system is not compromised by leaks into the surrounding ground areas so a secure lining is vitally important to the long term success of the project. Our depth of knowledge in this area is borne out by the fact the we continue to be specified by waste water consultants, engineers and water authorities, and our capabilities extend from single home reed beds of 100m² to beds in excess of 10,000m². Typical applications include Domestic wastewater, Groundwater remediation, Landfill leachates, Airports and Service Stations.